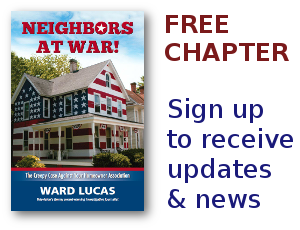 Neighbors At War Archives - Neighbors at War! Thank You, Hackers! Thank You!!! 1 Comment on Thank You, Hackers! Thank You!!! It’s been an interesting evening just casually surfing around the Internet. Haven’t done that for awhile. There’s just too much work involved in researching and writing my daily blog to go back to the casual surfing that I used to do. But I’ve noticed that the recent hacker attacks that took down and trashed my website have actually ended up scattering 300 to 500 of my past web posts all over the Internet! My old webposts used to be pretty well organized and confined just to NeighborsAtWar.com. But a search of “ward lucas” or “ward lucas hoa” show that the “gods of the Internet” never forget anything. And a trashed website actually leads to multiple sites around the world spreading the message of our Homeowners Rights Movement. Yes, Virginia, there really IS a Santa Claus. Except that she lives in Prescott, Arizona, and she’s been heavily ‘gifting’ herself with wads of cash. HOA cash. At last count, the total was $33,000. She’s being asked a few questions by the local gendarme, but heck, it’s Christmas. And surely homeowners in the Beaver Creek Village POA would have given her that money anyway. Get ready, Suckers, for the special assessments. Ah yes, Good Friends. This is the season where bad neighbors are supposed to join hands, ill will is forgotten and life is reborn. After all, the Christmas holiday theoretically celebrates the birth of Jesus Christ, the human form of God Almighty. The birth of Jesus and His subsequent ministry changed the world in a mightier way than any other man, religion, idea, or concept in history. Ten Million Dollar Kick In The Teeth! 1 Comment on Ten Million Dollar Kick In The Teeth! The HOA world is buzzing about a multimillion dollar lawsuit filed against the Henderson, Nevada Police Department. It’s a lawsuit that could throw a massive punch in the face of the American HOA movement, especially those which use coersive tactics to intimidate HOA critics. This really is a wild case. Two elderly residents of Sun City Anthem HOA in Nevada, tried to warn other homeowners that the board was illegally stashing millions of dollars of excess dues instead of returning them to residents. Any organization that doesn’t report such excess collections can face heavy IRS fines. I’ve said it before and will say it again. One of the upcoming heroes of the fight against rogue HOAs is Rodney Gray, from Texas. He’s now got a rough cut of his upcoming documentary, “The HOAx.” It’s wonderfully filmed and edited, and Rodney is an expert movie maker. He’s got an update on the documentary, and I’ve linked his site below.